Traumatic wounds are an important cause of morbidity and mortality in small animal medicine, having a signiﬁcant impact on both the patient and the owner. From a patient perspective, wounds that require long term treatment are often debilitating, prolong hospitalization time and can be potentially life threatening. From a client perspective, traumatic wounds can lead to a signiﬁcant ﬁnancial impact due to prolonged hospitalization, including the labor-intensive (and therefore expensive) treatment protocols often needed to reach a successful outcome. Wounds commonly encountered in veterinary medicine are frequently the result of motor vehicle trauma, animal bites or complications associated with surgery (i.e. incisional dehiscence). The vast majority of these wounds are simple therapeutic challenges, requiring only minimal treatment to allow almost immediate closure. In some instances, however, the wounds we encounter are more signiﬁcantly contaminated or infected or simply cannot be closed primarily due to extensive soft tissue injury. These wounds require signiﬁcant medical and surgical intervention. 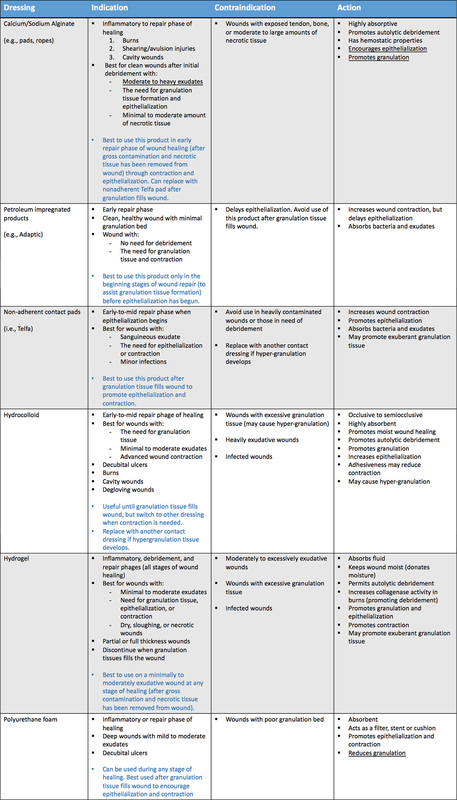 Herein lies the challenge for the veterinarian to choose the most appropriate open wound management regime that will lead to a rapid, uneventful wound healing process. Immediately cover the wound to prevent further contamination. Clip and aseptically prepare the area around the wound once the animal is stabilized. Culture the wound if indicated. Surgically debride dead tissue and foreign debris. Stabilize and cover the wound with appropriate dressing/ bandage to encourage wound healing and further debridement if needed. While this serves as a guide, every wound should be considered unique and will require an approach that is tailored to its individual characteristics. The most common wounds that need to be managed chronically by an open approach are avulsion/shear injuries, burn wounds, severe crush injuries that result in signiﬁcant skin or tissue loss, or wounds that occur after surgical wound dehiscence. Time is of the essence when treating traumatic wounds. A wounds susceptibility to infection greatly increases after 5-6 hours from the time of injury. Therefore, when possible (if the patient is stabilized during this time frame), every attempt should be made to treat a traumatic wound within this window. Generally, the sooner treatment begins, the better the prognosis. Whether a wound will be treated as an “open” wound is based on its appearance and characteristics at the time of presentation. In general, moderately to severely contaminated wounds, wounds older than 6 to 8 hours, infected wounds or those with extensive tissue loss should be treated as open wounds. Most wounds treated initially as open wounds, are surgically closed or covered with a skin ﬂap/graft after infection and contamination have been controlled. Some wounds, such as those with extensive tissue loss or those that are in areas that prevent primary closure (distal extremities), must be left to heal by contraction and epithelialization (healing by secondary intention). The immediate objective of open wound management is to convert the open, contaminated wound into a surgically clean wound that can be closed or left to heal by second intention. Depending on the extent of contamination and degree of tissue loss, this process may be limited to one treatment or may require weeks of open wound management before closure or second intention healing is complete. Most wounds that are heavily contaminated or infected will need several days of wet to dry adherent bandages or staged surgical debridement before this time. 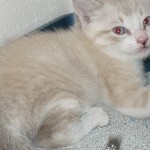 After this is accomplished, the chronic phase of wound management will commence and will require the selection of appropriate wound dressings to achieve success. Table 1: Wound dressing based on purpose. Chronic open wound management refers to the long term treatment of open wounds when conventional means of immediate or delayed primary closure cannot be accomplished. Chronic wounds are generally characterized by a lack of adequate skin or granulation bed for closure. The practice of long term wound management in veterinary medicine has evolved over the past 10 years to more closely mimic techniques employed in human medicine. Moist wound healing is an old concept in chronic wound management that has just recently become popular in the veterinary wound management industry. This concept is based on the idea that healing can be optimized in a moist environment, as apposed to a dry, desiccated setting. Since the original concept was introduced to the human medical ﬁeld in the 1960s, the use of dressings that keep wound tissues moist have become more widespread. This approach has been associated with increased healing rates, improved cosmesis, reduced pain, reduced infection, and reduced overall health care costs as compared to wet to dry bandage or adherent bandaging techniques. Moist wound healing has been found to stimulate the repair phase of healing. Proliferation and activities of ﬁbroblasts, endothelial cells, and epithelial cells are all enhanced, accelerating the formation of granulation tissue, angiogenesis, wound contraction, and epithelialization. Scientiﬁc evidence also strongly indicates that the incidence of infection is lower in wounds kept moist by an occlusive or semiocclusive dressing. Several mechanisms have been proposed to explain the anti-infection effects of the moist wound environment. Semi-occlusive dressings provide an excellent barrier against entry of exogenous bacteria into the wound. Moisture prevents tissue desiccation and necrosis, which serve as a culture medium for bacteria. Low oxygen tension in wounds covered by occlusive or semiocclusive dressings lowers the pH to levels that signiﬁcantly decrease growth of many bacteria in vitro. Because moist wound healing increases angiogenesis and thus blood supply to the wound, and because wound ﬂuid is kept in contact with the wound bed, the concentration of systemically administered antibiotic levels in the wound may be increased. Perhaps most importantly, the warm, moist wound environment under the dressing increases viability and activity of white blood cells and their enzymes, and keeps them in the wound to ﬁght infection. A process known as autolytic debridement occurs in this setting and can often replace traditional means of debridement. Table 2: Common wound dressings. Download printable copy. Wound dressings and bandages in the hands of an experienced, knowledgeable clinician can greatly enhance a chronic wound management protocol. If used indiscriminately or inappropriately, certain dressings can impair, delay or signiﬁcantly harm certain phases of healing. 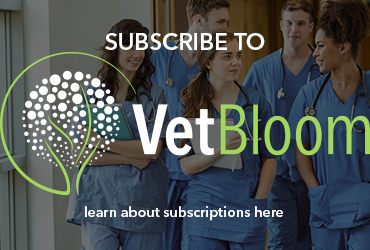 Newer, more advanced hydrophilic nonadherent contact layers are now available to the veterinary market to facilitate a moist environment during the wound healing process. They are individually designed to meet the different demands and stages found in the phases of wound healing. Some of these dressings are appropriate in promoting a healthy granulation bed prior to wound closure or grafting procedures, while others are more appropriate when epithelialization and contraction become the primary goal. It is important to remember that no single dressing will produce the optimum setting for all wounds or for all stages of wound healing. Moist wound healing is promoted by these dressings through the incorporation of hydrophilic materials into the wound bed. Hydrophilic dressings include hypertonic saline dressings, calcium alginates, polyurethane foams, hydrogels, hydrocolloids, and some topical medications. Most nonadherent, hydrophilic contact layers are highly absorbent and require infrequent bandage changes (q 1-7 days). 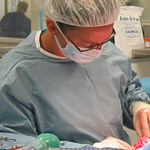 Some veterinarians are wary of these products due to higher cost of materials, however, with fewer bandage changes (most not needing anesthesia for removal), the overall cost is comparable to more frequently changed wet-dry bandages that usually require heavy sedation or anesthesia for application and removal. Semiocclusive dressings are the most common nonadherent moist wound healing products used. These include various forms of calcium alginates, foams, hydrocolloids and some hydrogels. These types of dressings require less frequent bandage changes, are painless to remove, strongly promote autolytic debridement, and hasten the repair phases of healing. Selection of the primary contact layer used for moist wound healing is based on factors such as wound size, shape and location, amount and type of exudate formed, need for autolytic debridement, percent coverage with granulation tissue and epithelial cells, and presence or absence of infection. The ideal dressing should maintain a moist environment, eliminate dead space, cause no harm to the wound or surrounding skin, provide thermal insulation, and act as a barrier to bacteria. Another type of nonadherent contact layer is an occlusive dressing. Occlusive dressings are virtually impermeable to air and therefore have the potential to exacerbate bacterial contamination, tissue maceration and ﬂuid accumulation. These dressings should only be used on healthy wounds with minimal exudation during the repair phase (granulation, epithelialization and contraction) of healing. Occlusive dressings are beneﬁcial in an environment that is in need of epithelialization and collagen synthesis. They require less frequent changes than other types of bandages. Examples of occlusive nonadherent contact layers include polyurethane ﬁlms, hydrogels, and hydrophilic beads, ﬂakes, powders, and pastes. These products are contradicted in infected wounds. The appropriate dressing ultimately is selected based on the phase of wound healing, amount of exudate that is being formed, type of wound, location and depth, presence/absence of an eschar, and amount of necrotic tissue, contamination or infection. In basic terms, three performance categories exist: dressings that maintain moisture, dressings that add moisture, and dressings that absorb excess moisture. 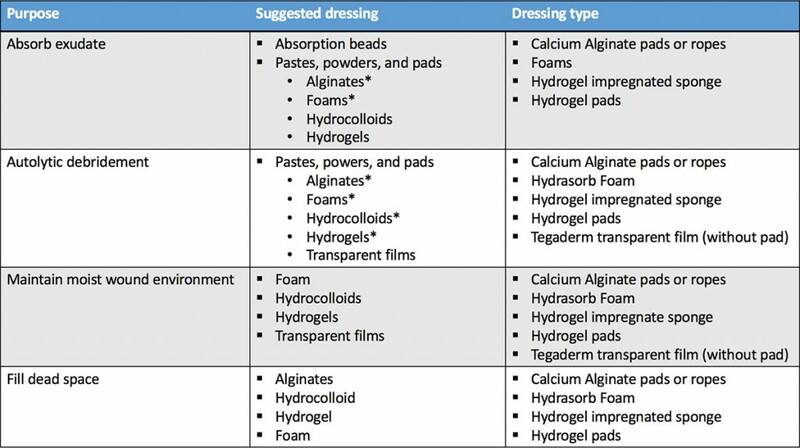 Based on the stage of wound healing, Tables 1 and 2 provide some guidelines when using these types of dressings. Bohling MW, Cambell BG, Swaim SF. Open wound care. Clin Brief 2007;Jan:19-21. Fanie MA, Shettko D. Evidence-based wound management: A systemic review of therapeutic agents to enhance granulation and epithelialization. Vet Clin North Am Small Anim Pract 2007;37:559-77. Possum TW. Small Animal Surgery, 4th ed, pp 208-19. Lee AH, Swaim SF, McGuire JA et al. 1987. Effects of nonadherent dressings on the healing of open wounds in dogs. J Am Vet Med Assoc 1987;190:416-22.